The Federal Motor Carrier Safety Administration (FMCSA) sets drug and alcohol education and training requirements for employees and supervisors. The requirements are listed in 49 CFR Part 382.601. Learn the essentials quickly and easily in our summaries for both FMCSA employees and supervisors. The FMCSA requires supervisors to receive both drug and alcohol education and training. 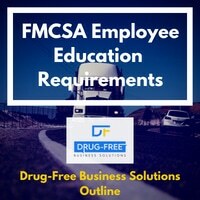 We summarize the regulation that lists out the FMCSA drug and alcohol education and training requirements. Learn what you need to quickly and easily. Learn about the FMCSA employee education and training requirements. We provide a summary of the regulations here, making it easy for you to learn what you need to know.